I'm directing a film in Ireland in the summer. I'm looking at using 2 perf because our budget will be tight and I don't think digital is right for the story. I've spoken to a few rental houses and I've been warned to stay away from the 2 perf format because of mag jams. Also, I'm told the Arricam LTs 2 perf are hard to locate. I was adviced to shoot 3 perf because it doesn't give trouble like 2 perf. Also, it seems it's easier to get my hands on the Panavision 2 perf systems. But since we're shooting in tight locations I'm wondering will the size be a problem - the Gold and Platinum are quite a bit bigger than the Arricam LT.
Has anyone used Panavision's 2 perf? Have you had problems with mag jams? Has the camera size been a problem? Are they small enough to work handheld and steadicam? If you've worked with 2 perf please let me know if you've had these problems. I've worked with 2 perf before. While it's true that 2 perf movements are rarer then 3 perf it shouldn't be a problem for you to source a 2 perf body. Size wise an arricam and a platinum are basically the same so space shouldn't be an issue. You do need to be more diligent with checking for hairs in the gate but good loading etiquette and a good focus puller will be on top of that. In my experience I never felt we had any more mag jams in 2 perf then in 3 or 4 perf but perhaps I was just lucky. Re Steadicam and 2 perf - if you go arri you can use the arricam lt - if you go pv then you'll most likely have a platinum as your a camera which is perfect for handheld but isn't suitable for steadicam, regardless of what people may say about the conversion kit. You'll need a lightweight 2 for your Steadicam shots which only comes in 3 perf so you'll have to shoot 3 perf for Steadicam shots. If I was your DP I'd opt for a pv platinum without hesitation unless you felt the majority of your shoot was to be Steadicam in which case I'd look at an arricam LT. Thanks Stephen. When you say you didn't get anymore mag jams with 2 perf than you did with 3/4 perf...does that mean you got none at all? How often did you get mag jams, if any? Most of the film will be on a tripod. But there are a few key moments that need handheld and steadicam. The last dramatic moments requires steadicam work - it's a number of scenes in a row that build to a climax. So while most of the film is well composed...this section has to let lose a bit. I'm not sure our budget could handle a second camera package. The XL2 would handle handheld, steadicam, etc. no problem, right? So it's either go 3 perf on that. Or take the risk on 2 perf with the Arricam LT - and hope there's no mag jams. In all likelihood you'll be required to carry a second body for insurance purposes so there's no reason that couldn't be a LW2 which would then solve your Steadicam problem. Mag jams happen on all film shoots regardless of wether it's 2, 3 or 4 perf. They're not an everyday occurrence but they do happen over the course of a long shoot. Not enough to worry about though, at least not in my experience. Once you get your DP onboard I'd let them steer you towards the package they're more comfortable using with the lenses they feel appropriate for the style of the shoot. Regardless of wether you shoot arri or Panavision you shouldn't have any major problems with 2 perf - it's a format that many filmmakers have used to terrific effect with no major problems - recent examples are David O Russel and Steve McQueen. I have vary rarely had mag jams as Stephen mentioned on any camera package, save for the Konvas 2M I used once. And even if you do have a mag jam, it is a trivial matter to get it rectified-- no different really than if you hit a drop frame shooting digital-- part and parcel of the territory. I used 2 perf on both David O. Russell movies that I was the 1st AC on. THE FIGHTER was shot with the Aaton Penelope while AMERICAN HUSTLE was shot with Arricam LTs. We never had an issue with jamming but gate hairs were inevitable. No matter what precautions you take, you will have them. Also, 2 perf is considerably noisier than the other options when considering sound. The only professional experience I have with this stuff is rather secondhand, but I am aware that Underworld was 3-perf and was a bit of a nightmare in post because keykodes stop working quite so easily. That was of course quite some time ago, and I would hope that things are a little more regular now. Here is a great view of the 2 perf gate vs. the 1:2.40 frame lines. 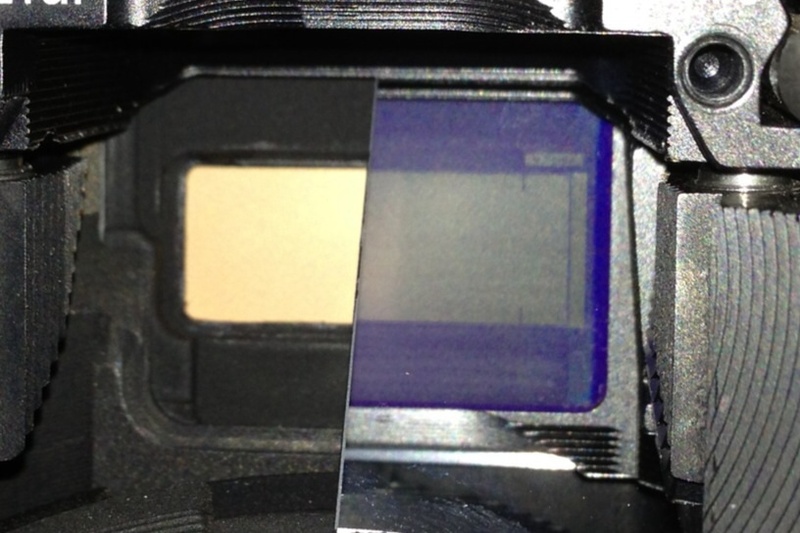 This view is looking through the lens port of an Arricam LT with the reflex mirror half way in so we can see the reflected ground glass on the right compared to the actual gate on the left. There is no space to speak of outside of the frame lines. The full gate is the format. This is why gate hairs are such an issue. I took this image while prepping AMERICAN HUSTLE. Gregory thanks for this. So how did you deal with the hairs...? (In post I assume) I've watched both of these films within the last couple of weeks to see how the format has been used. Both look great. Were the Canon k35s used for much of the shoot? As older lenses...how did they hold up? In days gone by if a hair showed when the gate was checked another take was called for. You still see the odd 'escaped' hair in older 'scope pictures on TV. I especially like the TV show where they shot Jack White on 2perf! I'm wondering if the lack of 2perf bodies at the rental houses you are talking to and their desire to sell you on 3 perf, are not entirely unrelated. 2perf has longer running times between changing magazines but then so does Super16, and I assume they aren't making these strange claims about Super16 too. I hear a fair bit of annecdotal evidence that the demand for 2perf is somewhat outstripping the supply. I note that Stephen Murphy is from Ireland and has experience of 2perf, so he might be worth talking to if you don't already have a DP lined up for your project. Also I question that even if it were true about "more mag jams" whether that would outweigh the cost saving of shooting 2perf. The hairs were dealt with in post by painting them out. Otherwise, we never would have finished the movie if we did extra takes for every hair. As for the K35s, let me direct your attention to the "AMERICAN HUSTLE" topic under the "On Screen" board. A lot of discussion regarding those lenses there. This is all very good info guys. Thanks. Thanks Greg for pointing me towards the AH board. Interesting stuff about those lenses...and that video you put up was just scary! I think I'd rather stick to Master Primes like on The Fighter. I do feel that film had more clarity to the image. Well done on your work on both. Sounds like AH was tricky...but you pulled it off! It's interesting to note that no one can locate a 2 perf Arricam. Only 3 perf. There must be a rise in 2 perf production with not enough bodies to meet demand. I myself have been considering Techniscope as an option for a project, although the look I am going for probably has to do more with the type of film stock I will use. The look of the picture is supposed to be influenced by the look of American Graffiti: all the wideness of anamorphic combined with the grittiness/grain of 16mm, with lots of saturation and a "jukebox" feel given off by the bright colors and grain. There's a lot of nighttime shooting involved, and the plan is actually to shoot for the most part in natural light -- however I'm really not sure if this is possible. I'm being told that to achieve the kind of grain necessary for the vintage look, we should just go with Super 16 as opposed to Techniscope. You could always shoot 35 and push it two stops or so which'll give you more grain and allow you to more easily shoot with natural light for your night EXTs. I got my 2 perf Arricams straight from Arri Munich, Germany. Does anyone know of any places who still convert 4 perf bodies to 2 perf? I just did a feature on 2-perf. We used a Penelope from Camera Rentals in Amsterdam. It's a great camera. Light and reliable. 150 rolls of film and not a single magjam. We got the hair or two, but most of them were in the safety, because you have a little bit of that even with 2-perf, fortunately. I think the biggest problem is light leaks, where you have a bright spot in the bottom of one frame which leaks to the frame below. That can be very distractive. One company doing conversions is http://www.arandafilm.com.au. But there are still more out there. I was in touch with Bruce at arandafilm this past december, they no longer do them there. Same with Slow Motion Inc.